Lighten up your diet with these Weight Watchers Buffalo Chicken Recipes! All of your favorite buffalo chicken dinners with WW Freestyle points and Instant Pot and slow cooker instructions! The great thing about Weight Watchers is that we can eat whatever we want, right? That doesn’t mean that we have to go crazy! There are only so many points in the day and thankfully, buffalo chicken recipes are typically low in points. 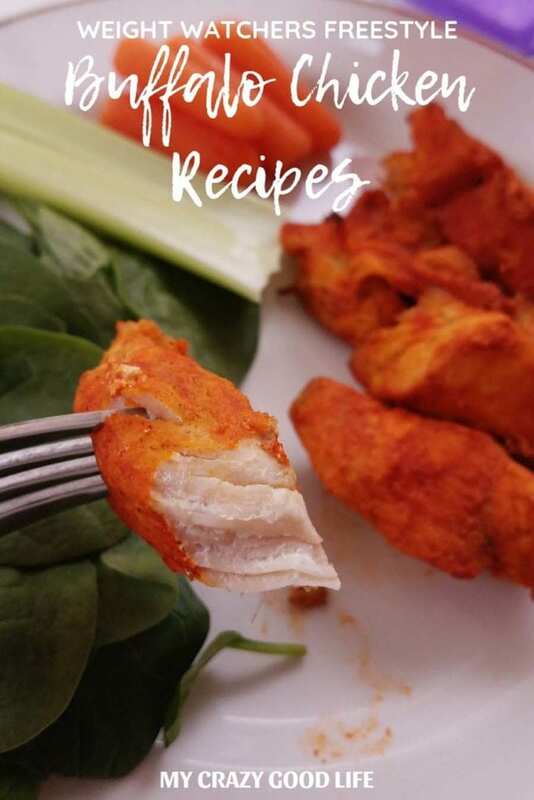 Now that boneless, skinless, chicken breast is 0 points on the Weight Watchers Freestyle program we can enjoy our favorite Weight Watchers buffalo chicken recipes without sacrificing very many points! We’re talking Weight Watchers dinners, lunches, appetizers, and more all with one thing in common: buffalo chicken! 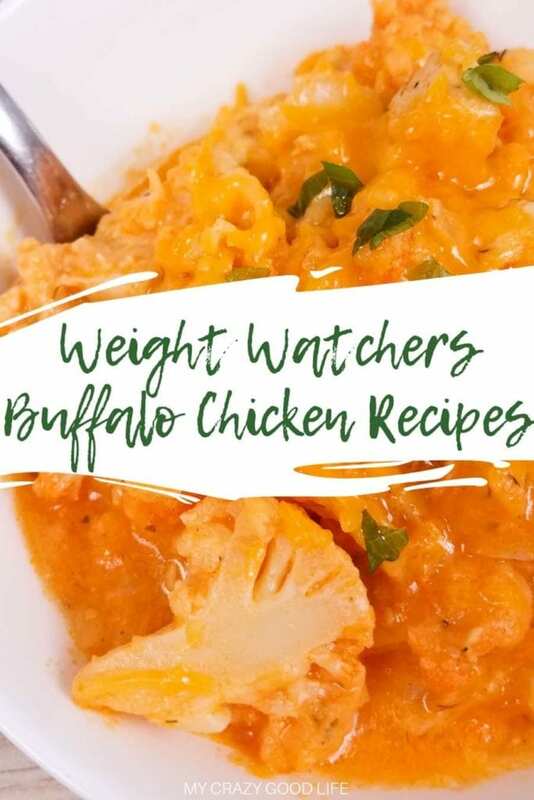 Where can I find your favorite Weight Watchers buffalo chicken recipes? 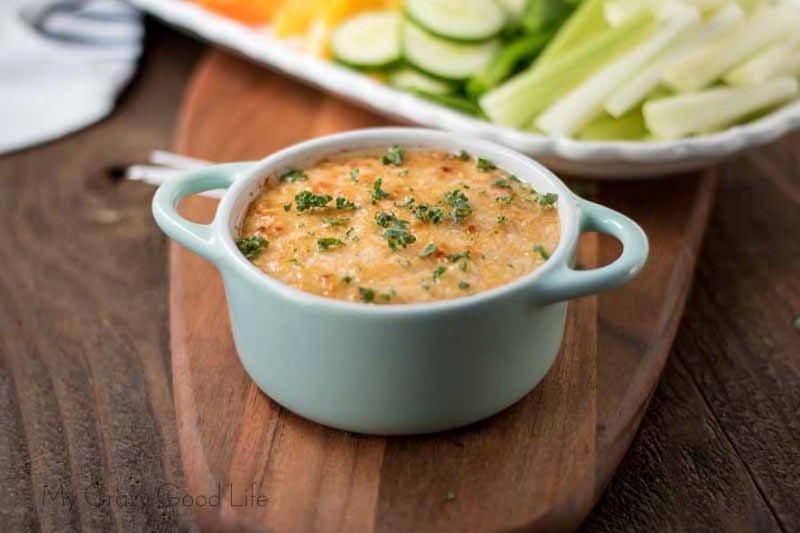 Weight Watchers Buffalo Chicken Dip | This is my favorite Weight Watchers buffalo chicken dip. It’s creamy, spicy, and perfect for snacking or with fresh veggies for lunch! Weight Watchers Buffalo Chicken Bites | These little nuggets of deliciousness can’t be skipped! They’re like boneless wings without all the fat and calories. Buffalo Cauliflower Mac And Cheese | Anyone up for a little twist on a spicy mac and cheese? Give this buffalo cauliflower mac and cheese a try, with cauliflower and chicken it’s low in points but high in flavor! Do you have any Instant Pot Weight Watchers buffalo chicken recipes? Buffalo Chicken Taquitos | Recipe Diaries | Use your Instant Pot to make the chicken for these delicious baked buffalo chicken taquitos…they’re quick, easy, and SO tasty! Buffalo Chicken Sloppy Joe’s | Slender Kitchen | Did you know you can totally use your Instant Pot to make these?! The saute function is SO nice and it heats so quickly and evenly that I prefer it over the stovetop sometimes! Buffalo Chicken Chili | Confessions of a Fit Foodie | If it’s worthy of a chili cookoff it’s worth a try in my book! 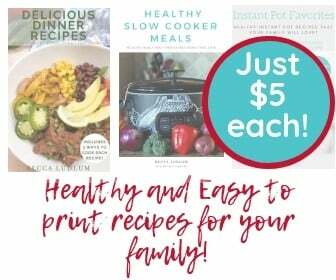 So easy (thanks to the Instant Pot) and healthy too! Can I make these healthy buffalo chicken recipes in the Crockpot? Slow Cooker Buffalo Chicken Sliders | Dash of Herbs | There’s always a celebration or a game day or any other excuse to make some delicious appetizers for grazing throughout the day, right? These buffalo chicken sliders should definitely be on the menu for your next event! Crockpot Buffalo Chicken Wing Salad | Dash of Herbs | Feel like you’re missing out on that great chicken wing flavor? Fear not! You can dig into this delicious recipe guilt free! 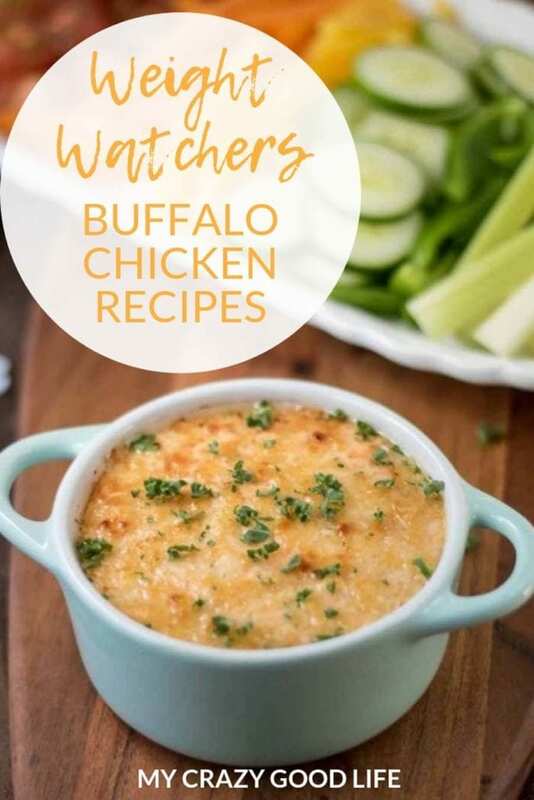 I’m looking for Weight Watchers buffalo chicken appetizers! Have any of those? Buffalo Chicken Pizza | Dash of Herbs | Here’s a craving curbing genius…buffalo chicken pizza that isn’t 15 points while still being indulgent?! Yes please! Buffalo Chicken Quesadillas | Slender Kitchen | What could be more perfect for appetizers than quesadillas! They’re portable food at its finest! Buffalo Chicken Flatbread Tacos | What’s Cooking in the Burbs | Is there anyone who doesn’t love tacos?! I mean, come on! So delicious and these flatbread tacos are perfect for appetizers! Buffalo Chicken Poppers | Dash of Herbs | Bite sized foods that pack a little kick are my favorite! These buffalo chicken poppers will be a hit with the whole family, not to mention they’re healthy and low in points! These Weight Watchers buffalo chicken recipes are for the oven or stovetop…don’t hold that against them! Buffalo Chicken Pasta | You Brew My Tea | This post is proof that you can still eat pasta on the Weight Watchers program and it packs all your favorite healthy buffalo chicken flavors. Buffalo Quinoa Fritters | Slap Dash Mom | Okay so maybe there’s no chicken in this rceipe…I promise you won’t miss it! These buffalo quinoa fritters are a tasty meatless Monday idea! Buffalo Chicken Lettuce Wraps | Carrie Elle | Lettuce wraps are a great idea for lunch! They’re low in carbs so you can even enjoy them if you’re cutting out carbs or gluten! Buffalo Chicken Pasta Bake | Drizzle Me Skinny | Talk about combining buffalo chicken with comfort food…this is a delicious and totally indulgent recipe that’s only 6 Freestyle Smart Points per serving! Weight Watchers Buffalo Enchiladas | Mrs. Erica | Okay so maybe they’re not traditionally Mexican but these buffalo enchiladas will still blow you away! Super tasty and easy to make. Buffalo Chicken Soup | Emily Bites | This light and healthy soup is so tasty because it packs the buffalo chicken punch we all crave! Buffalo Chicken Baked Ziti | Recipe Diaries | Give this Italian classic a spicy twist with some buffalo chicken! Buffalo Chicken Lasagna | One of Food | Lasagna is one of our favorites…I make a killer Crockpot lasagna but I’d never tried buffalo chicken lasagna before this…SO amazing, don’t miss out! Buffalo Chicken Tenders | You Brew My Tea | Do you like eating hot wings?! If so, you definitely need to give this recipe a try! Do you have any other resources for Weight Watchers that I can check out? Weight Watchers Instant Pot Recipes with Points | Here’s a great guide to some amazing Instant Pot recipes for Weight Watchers, all with points calculated and ready to go. Weight Watchers Instant Pot Dinner Recipes | Freestyle Recipes | Looking for just dinner recipes? I’ve got those all gathered up for you as well! Check out these Weight Watchers dinner recipes all with Freestyle Smart Points included. 75+ Weight Watchers Freestyle Desserts | Midlife Healthy Living | Here is a whole post dedicated to desserts! What could be better! Wellness Wins Program | Midlife Healthy Living | Here’s an awesome post that explains how the new Wellness Wins program works through Weight Watchers and the WW app!